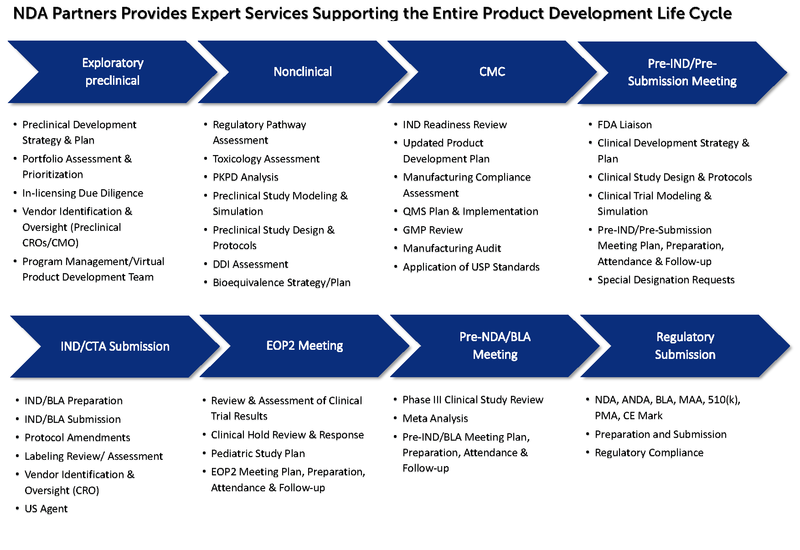 NDA Partners provides a comprehensive range of services across the product development life cycle for drugs, biologics, biosimilars, vaccines, generics, devices, combination products, and diagnostics. In addition to multi-disciplinary teams that provide custom solutions, NDA Partners’ clients have immediate access to the company’s entire base of Expert Consultants worldwide to call on for ad hoc advice or to answer critical questions that emerge during their development program. NDA Partners provides advisory services through its worldwide base of top-tier Expert Consultants. Advisory services include activities such as review and assessment of specific issues, membership on Scientific Advisory Boards, participation as an expert resource on client project teams, acting as the primary FDA contact on behalf of a client, or working on a part-time basis as an interim executive (e.g., Chief Medical Officer, Head of CMC, and Head of Regulatory Affairs). NDA Partners delivers high-value services through multidisciplinary project teams that provide customized solutions. Services are provided in areas such as product assessments, development and regulatory strategy, advice on difficult scientific issues, analysis of unexpected study results, regulatory readiness reviews, manufacturing systems planning, quality management systems, preparation for regulatory agency meetings, and preparation and submission of regulatory applications including INDs, ANDAs, NDAs, BLAs, PMAs, 510(k)s, and special designations such as Fast Track, Breakthrough Therapy, Orphan Drug, and Pediatric Waivers. 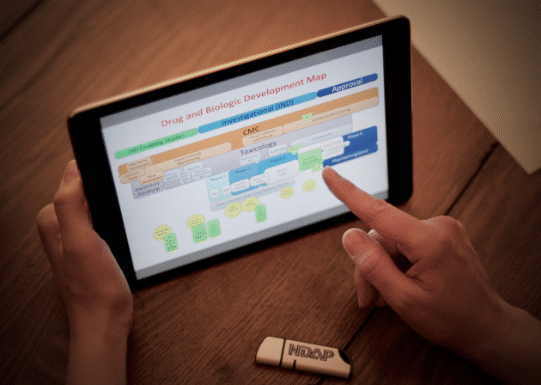 NDA Partners has developed a unique and powerful capability for partnering with inventors, discoverers, and owners of intellectual property and early-stage biopharma companies through the formation of world-class product development teams (PDTs) that design, plan, and manage product development programs. Benefits of an NDA Partners PDT include project teams consisting of highly regarded top-tier Expert Consultants with proven track records in product development, enhanced credibility with prospective investors, avoidance of equity dilution associated with awarding stock options to in-house staff, rapid program initiation, immediate adaptation of team composition as the required functional expertise changes over the course of the development program, and immediate access to supporting Expert Consultants in specialized areas as needed. NDA Partners provides litigation support services for the major law firms serving the pharmaceutical industry in cases involving claims such as antitrust violations, patent infringement, product liability, and supply chain failures. Services are provided by top-tier experts, including former FDA and industry senior executives, and may encompass expert reports, depositions, and trial testimony. Contact us at info@NDApartners.com or call 540-738-2550 to discuss your requirements and learn more about how NDA Partners can help you design and execute a world-class product development program.